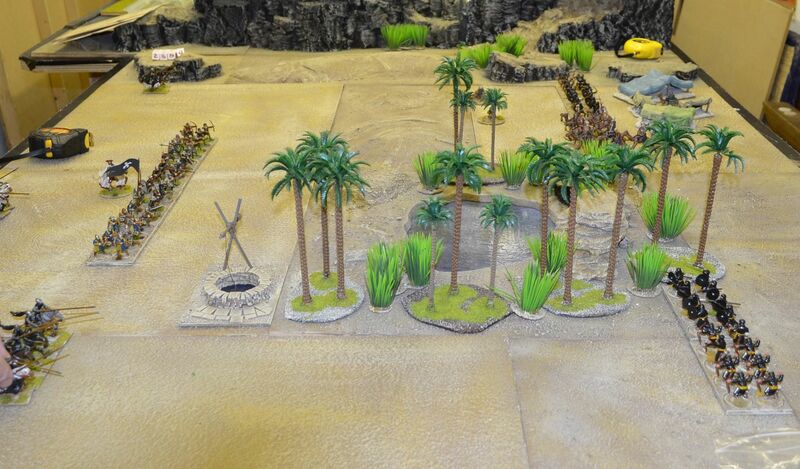 Over the last couple of weeks the Shed has taken on a distinctive Middle Eastern flavour, providing an opportunity to set up my desert boards and wheel out the Crusader and Saracen armies I painted the best part of two years ago. I think all Wargamers go through phases in their developments of new genres and I am no exception. 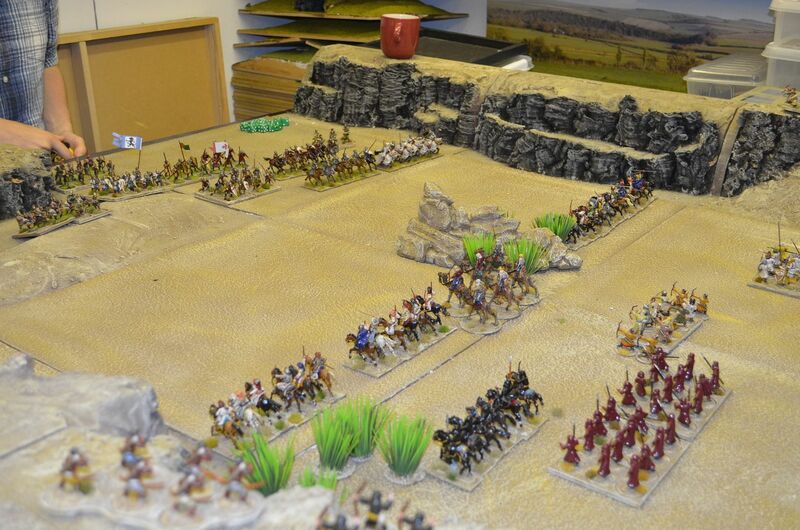 I originally set out to create the two Crusading factions with a view of playing a multitude of games including Lion rampant, Crescent and Cross and Hail Caesar. 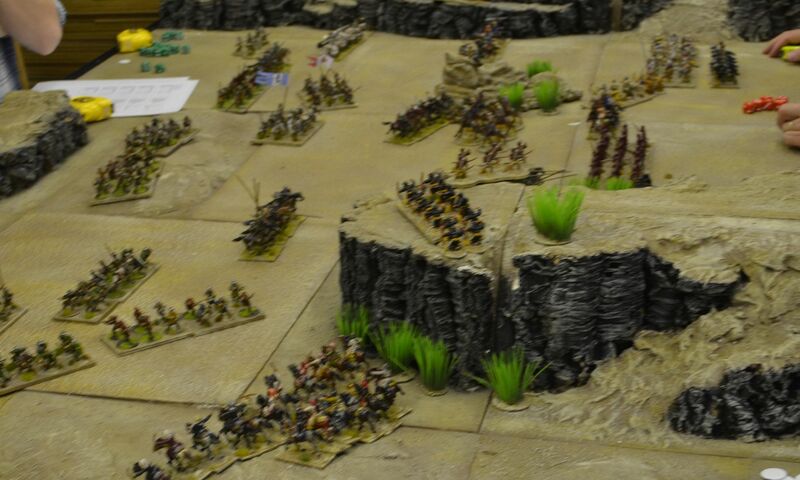 In fact these forces have only ever visited the table about three times in their life and in every case we have used the Lion Rampant ruleset. I have decided that whilst I am painting up my Napoleonic’s we will give these boys a bit more airtime. 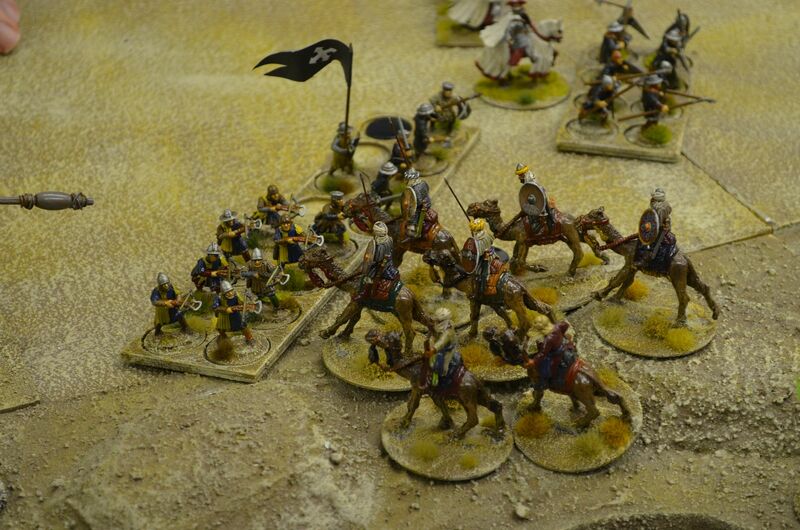 So two weeks ago Mark and I convened to play for the first time Crescent & Cross – these are the Crusading rules based on the successful Saga series brought to the wargames fraternity by Studio Tomahawk. Indeed I think I bought this ruleset over two years ago and having had a cursory glance through the beautiful rulebook we’d never actually played. The rules are effectively the same as Saga in terms of combat, movement and force design. Of course what makes the Saga rules so very different are the use of custom dice and the battle boards. The two factions are represented by three forces on each side. The layout of the boards are somewhat different to the original saga boards but the mechanics are very similar. I don’t intend to put together a full review of these but rather how we coped with the introduction of the new forces. In our first game Mark took on the Crusading force (chock full of charging knight abilities and governed by the key attributes of chivalry) whilst I took on the unpronounceable M.... faction (best described as suicidal fanatics). It became apparent in our first game that our force choice and composition did not best match the abilities of the board. 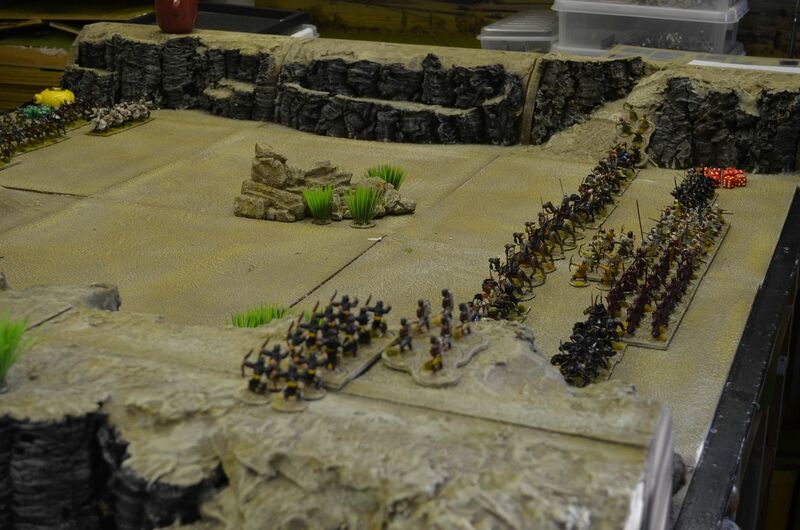 For example I would have been much better off have smaller units to throw themselves against their Christian foes. 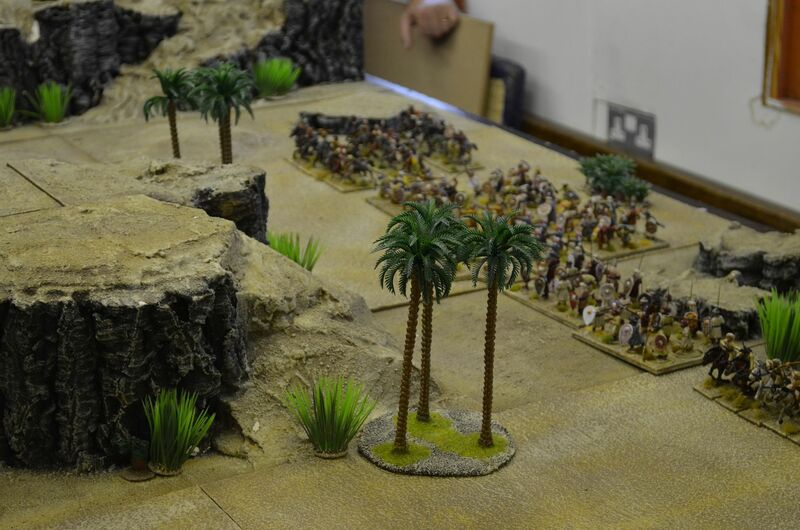 Suffice to say that the Infidel got crushed in the first game whereas the second game (Crusaders versus Saracens) appeared to be much more balanced. 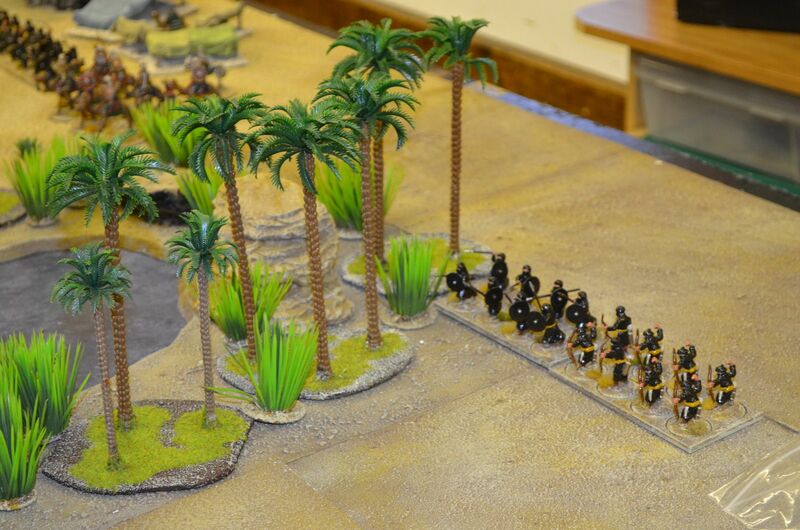 In the end the Crusaders won a second time round (a large part down to Mark learning the capabilities of his board). I think it’s fair to say that saga is a firm favourite in the Shed especially when there is only two of us – this is in part down to the fact we have played sufficient times to understand the intricacies of the original boards. It’s going to take time to get used to the C&C boards but we will persevere. 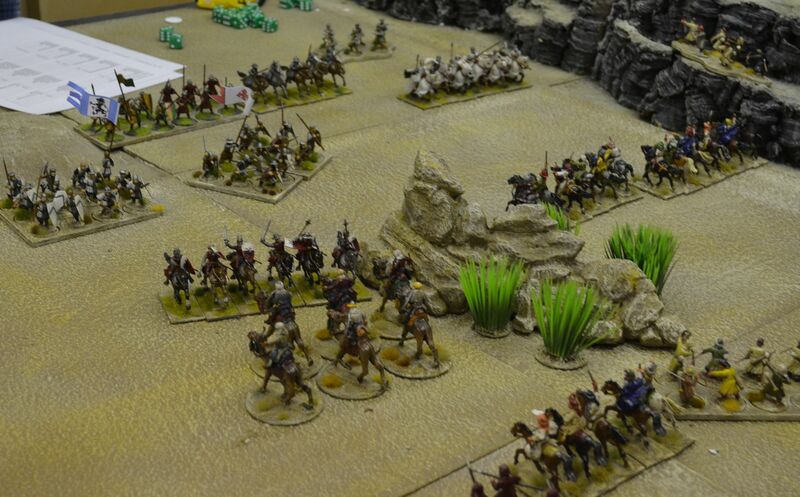 Our second Crusades game was played on Monday night – this time it was a much bigger affair using Lion Rampant rules with circa 70 points aside. I have already mentioned in previous posts that we have chosen to drop the rule that a failed activation causes the whole army to miss out on orders. Each unit still has to roll for activation (attack, move, shoot) but the game now moves much quicker and a sixty point plus game can easily be fought in a couple of hours with two aside. Alastair bought along his son on Monday so it seemed only right that as a family they should take on myself and Mark. This father/son combo played the Crusaders – they had over 18 units on the table – predominantly Knights, men at arms and armoured spears. 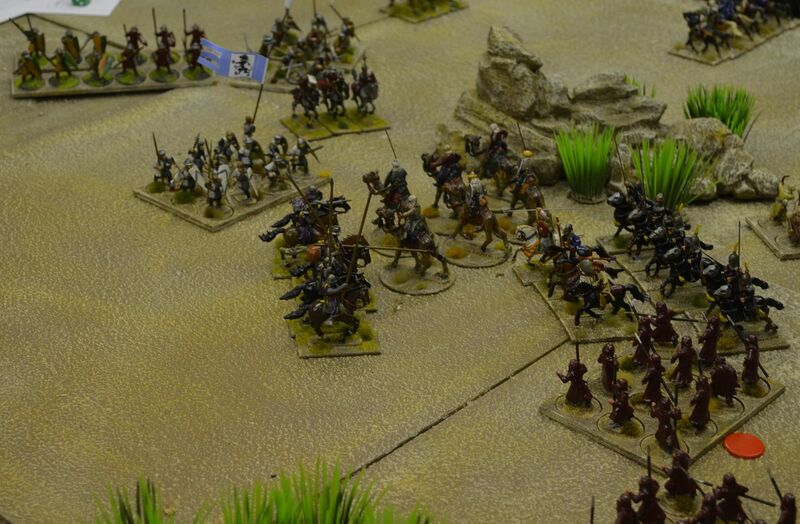 Their forces were augmented with a sprinkling of crossbows, archers and bidowers. By contrast the Saracens had 27 units on the table with the majority being lightly armed and far more missile troops – this was telling. A combination of numerous missile troops, some great attack rolls and some really poor ( and I mean poor) morale checks on the Crusading side gave the Saracens a crushing victory. The Crusaders lost or had routed over 70% of the forces for possibly less than 20% of the Saracen force. If anything volumes of missile armed troops (couple with skirmishing ability) continuously saps the Crusader strength and once courage/morale throws go awry there is little they can do to force a fight on their more lightly armed opponents. I am still in two minds as to whether these rules are biased in favour of archery but in our particular game they did force a decisive decision. I now know that the Crusaders themselves knew they had a deficit in this area of force composition and employed their own mounted skirmishers so maybe next time we will give them some of these versatile troops. Nice pics of the games. Both rulesets sound fun in there own different ways. Despite our terrible morale saves it was a really fun game. 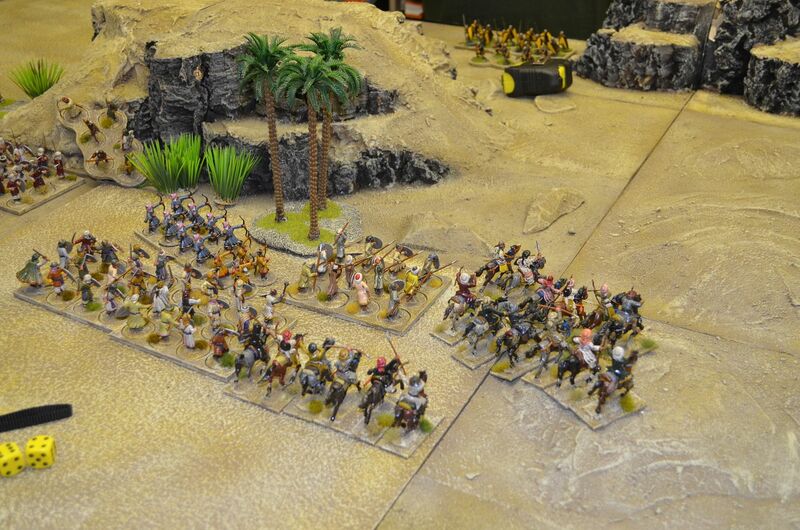 It certainly felt like a Crusades game ought to with hordes of light cavalry wearing down the heavier Crusaders. 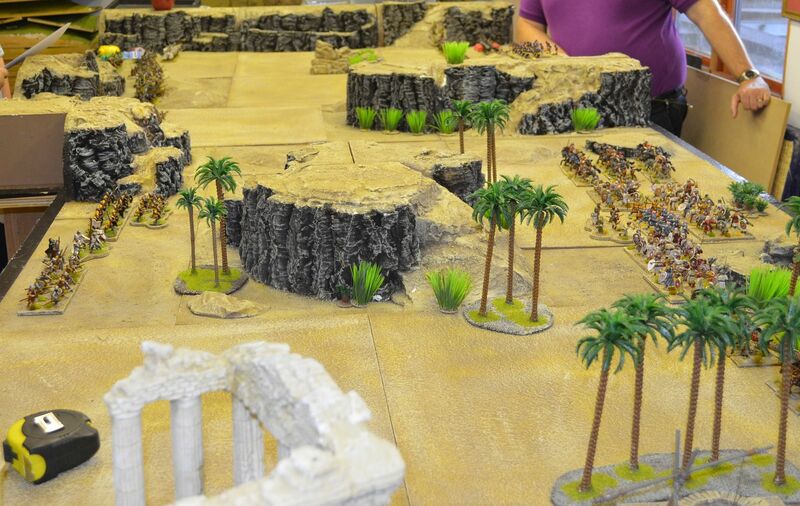 A great looking game with beautiful figures and terrain, I love the hills! Interesting reflections on the two rulesets. They've said it all, but yes, a lovely looking game. Thanks for sharing!